As we prepare to say "goodbye" to this community, we want to leave you with some lasting tips and advice we've learned over the years. 1. Challenge Yourself: Whether in physical fitness, your platform, interview, or talent, push yourself to be the very best you can be. You can't live life from your comfort zone so push yourself to achieve what you might not think is possible. You may be surprised with the results. 2. Own Your Style: The Miss America pageants are about health and fitness, but remember that you are beautiful inside and out. Don't focus on what everyone else is wearing, be true to yourself, your likes, dislikes, and what looks best on you. And remember, a big smile and a sweet heart are what truly makes you beautiful. 3. 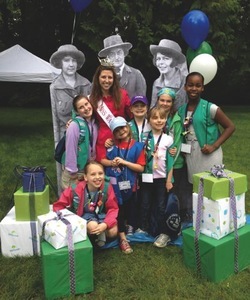 Be Involved: As titleholders, you are young women who are looked up to. Get out in your community and be involved. Be creative when it comes to fundraising, but make sure your heart is in your work and to always put others first. 4. Socialize: Since social media is such an important part of today's society, make sure that you are professionally representing yourself when on social media. Also, keep your followers updated on all of the great things you're doing and thank them for being a part of your journey as a titleholder. They will greatly appreciate it! 5. Be Confident: Throughout the many years and articles we've written, confidence is one of the top things pageant judges look for when considering the next titleholder or Miss America. Every one of you is capable of so much, be confident in who you are and everything else will follow. 6. Say Yes to the Right Dress: Don't settle when it comes to picking your dresses for the pageants. Find the one that you feel stunning in and be confident that your gut choice in style is the right one. 7. Be a Hard Worker: It doesn't matter if you've been in pageants your whole life, or are just entering them for the first time, hard work and perseverance are the two keys to pushing yourself to new heights, making yourself stand out, and giving you unwavering confidence. These are some of the foundations that make a great person and potential Miss America. 8. Thank Your Family: Family is so important in this organization. Whether its your actual family, or your fellow contestants, your family and support group is so important and should be recognized on a daily basis for pushing you to be where you are now. We're all family in this organization, win or lose. 9. Share Your Passion: Whether its through your platform, or in your community service, you passion should be so apparent, that people will know you by what you do. Find your niche and stick with it. There's nothing more appealing than a strong, confident, young woman with a passion to make a difference in this world. 10. Represent: Striving to get a crown is a great goal, but unless you exemplify all four points on that crown, you are not worthy of it. Remember to always aim for success, be true to your individual style, be thankful for the scholarships you've been given, and serve others. This will not only get you far in the Miss America journey, but in life as well. Thank you, each and every one of you, for your encouragement, belief, and passion. We hope to have made an impact on your personal journey with the Miss America Organization, because you’ve definitely made an impact on all of us at fourpoints. What does style mean? In a nutshell, style means looking and feeling good. And that means something different for everyone! Here’s how to create a signature look and feel that works for you. The price of looking good can often be very high—but it doesn’t have to be. You can cut corners in certain areas that will leave you looking just as great with a few more dollars in your wallet. Drugstore products, like Cetaphil or Neutrogena, are often just as effective as department store potions. As an added bonus, some drugstores have return policies that allow you to try a product and exchange it if you aren’t happy with it. Our favorites are Cetaphil lotion, Purpose soap, and Oil of Olay moisturizer. There are also several at home remedies for skin problems that are inexpensive, natural, and can be whipped up right in your pantry. Grind up oatmeal, mix it with honey, and you have yourself a wonderful rejuvenating max that will perfectly prep your skin for spring. If you have chapped lips, mix raw sugar with petroleum jelly in the palm of your hand and smooth over your lips. The result is instant exfoliation. Petroleum jelly can replace even the most expensive eyecream. Smooth a dab under your eyes at night (be sure to remove contacts first) and by morning it will be absorbed. Your under eye area will look plumper and refreshed. Don’t spend money on high tech exfoliators. Instead, buy baby wash clothes and use them, along with your usual cleanser, as a quick, sustainable exfoliation method. When it comes to cosmetics, you already have your favorites, your tried and true products. Use these suggestions to mix up your beauty routine and make it a little easier on your wallet. To tame eyebrows, use generic brand clear mascara instead of an expensive brow gel. When buying eye shadow, invest in a high quality neutral base (think gold or champagne.) This makes your base stay longer and look more polished. You can augment the look with less costly colored eye shadows and save money without sacrificing your look. Everyone deserves to look their best. Follow these simple tips and you can step out in style for less money! Bad hair day? We’ve all had them right? The goal is having a good hair day ninety percent of the time. Here are a three tips to consider to ensure you’re more satisfied with your hair more of the time. Round - Hair should be cut to create the illusion of length in the face. To achieve this, create height on top of the head and minimize hair width my keeping it flat on the sides and around the ears. Oval - Can wear most hair cut styles and lengths with it still looking "right". Rectangular - The ideal style of haircut for this shape will width at the sides, which will disguise any narrowness. A fringe can also shorten the face, and a style with a side part will help to reduce the square appearance. Diamond – You can turn your diamond into an oval by creating width at the forehead and minimizing it at the cheekbones. Pear - The objective of a suitable style of hair cut is to give the illusion of an oval face by creating width at the forehead and temples. Square - Hair should be layered around the face to soften the jaw line. Hair should wisp around face to reduce squareness. Heart – By adding width at the jawline, heart-shaped beauties can create the illusiong of an oval-shaped face. No matter what your exact face shape is, there are some simple guidelines that, when followed, will help you reach that good hair goal! Get your hair cut frequently – When you have short, you need to get your hair cut every 4-6 weeks, depending on how fast your hair grows. But what if you don’t have short hair? You may be able to put off a cut for a little more than six weeks, but don’t put it off for too long. By getting your hair cut every 6-8 weeks, you are maximizing the style of your hair cut and maintaining maximum health of your hair. Use the right hair product – We're sure your stylist has told you that product makes the hairstyle. And we couldn’t agree more. Product does make the difference! We have our favorite products including Bed Head’s Root Boost and Superstar, but the best product for you product depends on your hair type and length. Talk with your hair care professional. Whether you have a good or bad hair day can change your entire mood. Therefore, taking the time to care for it can make a difference! Be sure to really take a look at your cut and how you care for it and you’ll be sure to have more good hair days! Social media is all about timing. If you have breaking news on a winner, post quickly and accurately. Here are some tips and tricks on running great social media pages. 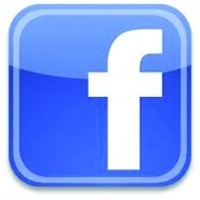 Facebook: Post one to three times a day. Post photos with links back to your website, because photos get the most “Likes” and click-throughs, and you want to inform girls about how they could be the ones in the photos. Instagram: Who doesn’t take a lot of photos at the pageant? Use this social platform for snapping those quick pics of the contestants on stage—and, of course, the winner! YouTube: Seeing the reaction of contestants becoming titleholders is the best! Share that with future contestants by promoting it on your website, Facebook, and Twitter pages. Pinterest: What girl does not love Pinterest? Pin photos of dresses, inspirational quotes, shoes, jewelry, share videos from your YouTube channel … the possibilities are endless! No one has a whole day to devote to social media. That’s why these social managers are a great way to keep you on top of your social posting game. Hootsuite: The most popular social manager makes it easy to keep track of posts across multiple channels, as well as conversations, analytics, and more. Tweetdeck: This is a good resource if you use Twitter a lot. Manage Twitter feeds, schedule posts, and keep track of all inbox messages. SproutSocial: A great business tool to keep your messages organized, make scheduling posts easy, and allow you to keep tabs on your engagement and outreach to new followers. Written by: Chelsea Stoskopf is fourpoints magazine's editorial assistant. 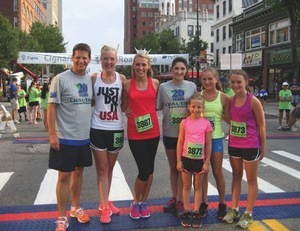 Jennifer McKenna, Allison’s partner at McKenna Walsh Coaching and Miss Virginia 2002, says it is because she incorporates her brand into every aspects of life, from pageantry to family to business, that she is more recognizable. It could also help an individual stay focused on who and what she truly is. “It allows you to develop a strong sense of self so that you can clearly and articulately describe not only who you are, but also portray that same message through your actions and affiliations,” Jennifer said. 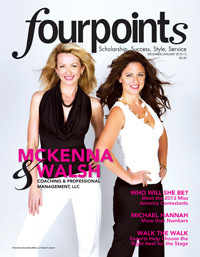 Read more about branding and McKenna Walsh Coaching in the December/January 2012-13 issue of fourpoints! Recruiting contestants could be a challenge for any pageant organization. But what drives most young women who enter the pageant world? Scholarships! That means programs need to do all they can to raise as much scholarship money as possible—and make sure the overall program is funded. Here are ten ideas to help you with your fundraising. Dressing Every Shape, Personality, and More! Every titleholder and contestant is different—from talents and platforms to coloring, style preferences, and body type. But any woman could look her best by dressing for her size and style. For you to look and feel your best, creating a flattering wardrobe is important. Any woman could perfect her look by carefully choosing the right clothing and creating a wardrobe full of classic basics. Take stock of your budget, body type, and preferences, and figure out what looks best on you. Take an afternoon and spend it at a department store, trying on several different styles of tops and bottoms. By the end of the day, you’ll have a good idea of what looks good on you—and what doesn’t. Every contestant wants to look her best on stage, especially in swimsuit! Here are five of our favorite tips on how to look your most healthy and fit.